Amar’e Stoudemire is a Pro Basketball Player, Actor, Author, Producer, Motivational Speaker and Philanthropist who was born on November 16, 1982 in Lake Wales, FL. From his father passing away at a young age to attending six different high schools, childhood was rough for Stoudemire. At the age of 14, he began to play organized basketball, which changed his life forever. Despite playing only two years of high school basketball, Stoudemire earned many awards, including: USA Today All-USA Basketball First Team, Florida’s “Mr. Basketball,” Orlando Sentinel Florida High School Player of the Year and McDonald’s All-America Game. His phenomenal skills earned him a scholarship to the University of Memphis. 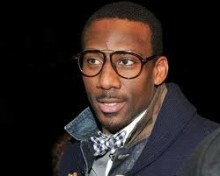 But with his star on the rise, Stoudemire entered his name in the NBA draft. The Phoenix Suns selected Stoudemire with the ninth overall pick in the 2002 NBA Draft, making him the only player drafted straight out of high school that year. In his rookie season, Stoudemire averaged 13.5 points and 8.8 rebounds per game, with a season high of 38 points against Minnesota. Stoudemire won the 2002 NBA Rookie of the Year award, becoming the first player drafted out of high school to do so. During the 2004-05 season Stoudemire teamed up with point guard Steve Nashto lead the Suns to a 62-20 record. Averaging 26 points per game that year and achieving a new career high of 50 points, he was selected to his first All-Star Game. During the 2005-2006 season, Stoudemire underwent two knee surgeries, including microfracture surgery. Recovered and ready to start the 2006-2007 season with a splash, Stoudemire requested and was granted the opportunity to change his jersey number to from #32 to #1. In 2007, he averaged 20.4 points and 9.6 rebounds and appeared in his second NBA All-Star Game, where he scored 29 points and grabbed 9 rebounds and was runner-up for MVP. This represents arguably the most successful comeback from microfracture surgery, which has derailed the career of many an athlete. In July 2010, Stoudemire signed with the New York Knicks as a free agent. That year, he broke two Knicks franchise records with nine straight 30-point games and nine straight games shooting 50 percent or better from the field. In 2011, he played in the NBA All-Star Game, the first Knicks player to do so since Patrick Ewing in 1992. And in 2012, he and the Knicks went to the first round of the playoffs. During the season, he had averaged 17.5 points per game and 7.8 rebounds. Since entering the NBA in 2002, Amare Stoudemire has been active in the Phoenix and worldwide community. In 2003, Amar’e started the Each One Teach One Foundation and funded his first AAU Team, Team STAT. Later that year, he was the winner of NBA Week on “Wheel of Fortune,” donating his winnings to the Boys & Girls Clubs of Greater Phoenix. In November 2008, Stoudemire received the NBAs Community Assist Award, for his work with his Each 1, Teach 1 Foundation, and its efforts to provide safe drinking water in Sierra Leone by funding the building of water wells in impoverished villages. Stoudemire visited the country in the summer of 2008, making visits to water well sites and meeting with President Ernest Bai Koroma and the rest of the cabinet. Do you want to hire Amar’e Stoudemire? Directly request a quote. In 48 hours we can send you the availability of Amar’e Stoudemire If you would like to book Amar’e Stoudemire, Entertainment Booking Agency is the right place. We will offer you the best price and contact the management or we directly contact Amar’e Stoudemire. For corporate appearances or speaking engagements you can contact our agents and the will help you true the process. Tags: hire Amar’e Stoudemire, Amar’e Stoudemire booking, book Amar’e Stoudemire, Amar’e Stoudemire appearances, find more information on booking Amar’e Stoudemire for appearances, Amar’e Stoudemire speaking engagements, Amar’e Stoudemire endorsements/spokesperson, Amar’e Stoudemire appearance fees, Amar’e Stoudemire booking agency contact info, biography of Amar’e Stoudemire, Contact an artist booking talent agent find a speakers bureau that can book Amar’e Stoudemire, speaker booking agency for Amar’e Stoudemire, Amar’e Stoudemire booking agency, Amar’e Stoudemire booking for corporate event. EBA is one of the biggest entertainment booking agencies in the World. We book hundreds of celebrities, artist, athletes and speakers in a year. Important to know is that we are not claiming to be the management of Amar’e Stoudemire. We are not the official agent for Amar’e Stoudemire. Companies from around the globe book these artists and speakers true our company be course we have one of the biggest networks and we always have direct contact with the artist or the management. We help you to find the right celebrities for your corporate of private events. Please contact one of our agents to get free advice and we will help to get the world-famous artist on your party.